Q: How can you tell when a teenager — or a politician — is lying? Okay, seriously. How can you tell when a teenager is lying to you? 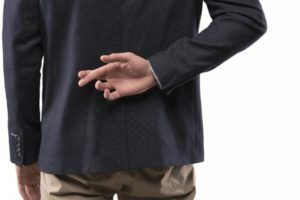 The article below by Dr. Travis Bradberry, best-selling author and expert in emotional intelligence tests and training, offers eight practical insights to help us spot when someone is lying. Notice that I didn’t say “help us spot a liar,” because apparently that would include most of the population. To back this up, Dr. Bradberry refers to a decade-long psychological study that revealed that 60% of people lie two to three times during a typical 10-minute conversation. You might want to keep this article handy for the next time you think your teen (or almost anyone for that matter) is trying to get away with some verbal trickery. Oh, and the answer to the above question for the politician is still 100% accurate. I would give the benefit of the doubt to the teenager, though. People lie in everyday conversation to appear more likeable and competent. While men and women lie equally as often, they tend to lie for different reasons. “Women were more likely to lie to make the person they were talking to feel good, while men lied most often to make themselves look better,” Feldman said. It’s easy to lie with words, but our bodies know (and show) the truth. A clear sign that someone is lying to you is when their words are saying one thing and their body language is saying something entirely different. For example, someone is telling you a sad story about the personal struggles that made them miss work, yet they’re smiling while they’re talking, and their hand gestures and body posture are animated and excited.